WEBSERWER.pl Review 2019: Is WEBSERWER.pl a Good Hosting? 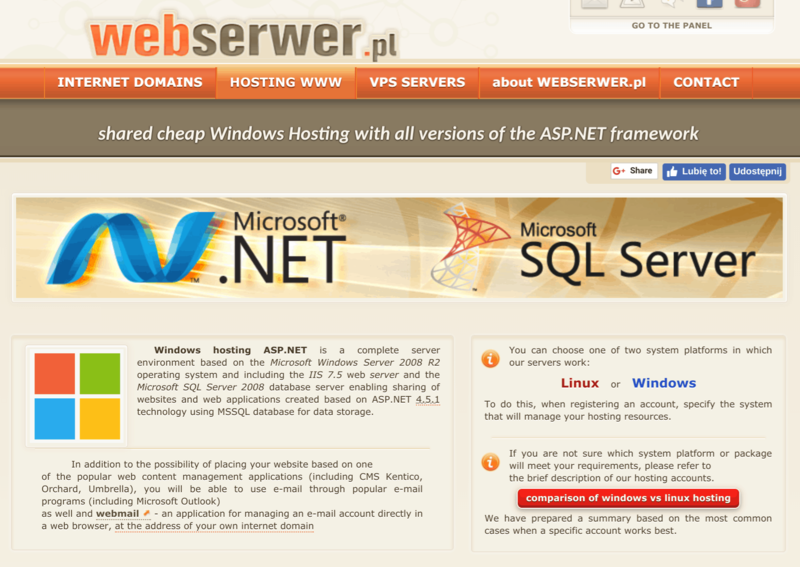 Polish hosting provider WEBSERWER.pl has been in business since 1999. Though its plans are comprehensive, it is let down by a poor presales customer response and a complicated sign-up process. WEBSERWER.pl has been in business in various guises since 1999. With more than ten staff currently employed, this Polish provider offers a selection of hosting services from its Polish language website. WEBSERWER.pl co-locates its servers in the COIG Data Center, Katowice, Poland. Its ISO 27001 certification and Tier III status should mean less than 1.6 hours of downtime a year. And it uses green energy, too. Whilst WEBSERWER.pl doesn’t own the data center, it does own its own Dell PowerEdge and HP ProLiant rack servers with EqualLogic and Fujitsu disk arrays that are load-balanced, so you don’t need to worry about peaks in website traffic. There is no uptime guarantee, but an average annual uptime of 99.7% is stated. This is lower than the 99.9% industry standard, and I have no way of verifying it, but maybe it’s more honest than the other providers who state a higher uptime without any real proof either. You can choose between Windows and Linux operating systems. 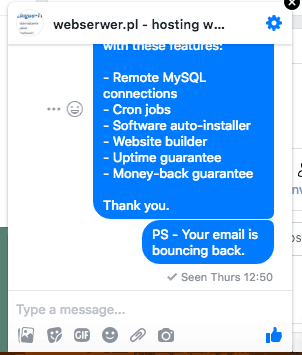 Depending on the OS you choose, you get support for Microsoft SQL and ASP.NET or the Linux/Apache/MySQL/PHP (LAMP) software stack. All plans come with FTP accounts, phpMyAdmin, daily backups, and Cron jobs. The aforementioned software is appropriate for advanced users, but beginners are less well catered for since it seems there is a software auto-installer (e.g., for WordPress and Joomla) but no website building tool. Support didn’t tell me otherwise, because they didn’t get back to me at all. WEBSERWER.pl’s prices range from very cheap to slightly overpriced. All plans include the same features but have increasing resource allocations, so new website owners might find the second-cheapest plan will suffice with its 5 GB disk space, unlimited domains, and unlimited bandwidth. Domain names cost extra, and a free SSL certificate can only be obtained if you select a .webserwer.pl subdomain (which I doubt many people will do). Plans can be purchased on three or twelve-month terms, and there is no money-back guarantee, but there is a 14-day free trial that gives you a little time to try before you buy. Getting signed up is slightly more complicated than with other shared hosts. Firstly, you need to fill out several pages of online forms to create an account. Then you need to log into your online banking to set up a payment. 20/7/365 customer service (yes, 20 hours per day) can be accessed by phone and email, although there was an issue with the email address when I tried it. There is also a knowledge base that provides some of the information you will need to support yourself. WEBSERWER.pl has many years of experience in the website hosting industry. Its plans come with a below-par annual uptime, but the packages are surprisingly comprehensive with support for PHP 7 and other programming languages. Wondering how WEBSERWER.pl stacks up against other Web Hosting companies? Enter any other Web Hosting company and we will give you a side-by-side comparison.